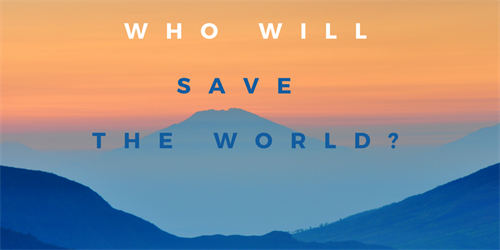 Who Will Appear Save the World? On Black Thursday on October 24th of 1929, Richard Whitney confidently strode onto the floor of the New York Stock Exchange. His regal and confident bearing stood in bas-relief to the surrounding scenes of despair and mayhem. Walking the floor of the exchange, he stopped at the post for U.S. Steel and announced in a loud voice, “I bid 205 for 10,000 Steel.” You could hear onlookers gasp. Whitney made several other similar booming pronouncements at the posts for AT&T, Anaconda Copper, General Electric, and others. The Dow Jones Industrial average roared back to the black, closing on Black Thursday at 299. Last week Mario Draghi, the European Central Bank President, performed his usual shtick. His loud proclamations drove stocks higher from their early morning slide. Yes, the European bourses responded as expected. However, the sigh of relief lasted only 30 minutes. Then stocks tanked again. He was no Richard Whitney. On this side of the pond, it was Yellen performing Act I. Her scheduled congressional testimony was a natural platform to soothe markets. Though the Fed claims to be “data dependent,” the only data that really matters is the closing levels of the major stock market averages. Without so much as a salute to her greatness, stocks continued to sag. And so, on Friday, it was Bill Dudley’s turn on stage. As the head of the New York Fed, he wears a cloak of credibility that is usually reserved for Fed Chairmen and CEOs. He duly performed his act. He promised patience, he assured investors that the Fed is data dependent and that negative interest rates are not out of the question. He wheedled and cajoled and, lo and behold, stocks levitated. Not enough to erase the horrors of this year’s early trading, but lift there was. But, not so fast, Bill! Before you wear the Richard Whitney crown, we must also recognize the whale in the room. J.P. Morgan CEO Jamie Dimon came out to perform his civic duty as well. You’d be forgiven for thinking that his production might include returning money to taxpayers, announcing that he is stepping down from heading this often-criminal-enterprise, or even that he saved widows and orphans from a burning building. No. Friday we awoke to the news that Jamie Dimon has purchased approximately $26.6 million worth of J.P. Morgan stock. Thursday's purchase, at an average price of $53.18 per share, represents Dimon's total pay for 2015 of $27 million. Most of it was paid in the form of stock, he must have scratched by on the $400,000 cash. With greater force than Mr. Whitney's bold proclamations, Jamie’s stock purchases have been reported by all the major financial media. Such a confidence-inspiring move from the CEO of America’s largest bank must mean something. And surely it does, just be careful what you impute. On July 8th of 1932, the DJIA finally bottomed at 41.22, a full 86% lower than the Richard Whitney “put”. And on March 8, 1938, Richard Whitney, former Chair of the NYSE, began serving a 3 year and 4 month jail term for embezzlement and misuse of funds at Sing Sing. If a fighter stands up only to be knocked down again, his corner team must consider throwing in the towel. If this fighter is knocked down 6 times in the previous 4 rounds, any sane referee would call the fight. But gold is bouncing back yet again. This time, it seems to have critical support. For most of the past six years, investors have poured into stocks as the primary hedge against wanton central bank credit creation and currency debasement. Now, gold has become the hedge. Since the gold market is exponentially smaller than the global equities’ markets, its movements will be dramatic. Gold has rallied on market weakness before. Usually, it will hover above its 200 day moving average for a short while before being hammered back down again, almost always in concert with the pronouncements of a stock market savior. So while stocks plunged on Thursday, gold prices soared 5.5% (at peak). But, as you already know, someone again surfaced that day to save stocks from their rout. What has been unusual this year, among the past four, is that gold was not reciprocally sold. No. It has held firm and even moved higher. While your team at HBA has a vested interest in seeing gold go higher, it is starting to attract the notice of other institutions, not normally known to be fans. J.P. Morgan (yes that one), Goldman Sachs, and HSBC (I know, a roundup of the usual suspects! ), have all come out with higher targets for the gold price. It’s getting to the point where we can’t keep up with the oxymoron(ic) pronouncements! From the IMF’s love affair with negative growth to TESLAs non-GAAP GAAP figures, we are clearly confused. But the oxymorons keep coming! Next up for your consideration is the definitely, maybe, naturally strange, amazingly awful Negative Interest Rate Policy. So as we move from the conspicuous absence of interest earnings, growing smaller now to negative income, we are told that this cruel kindness is the only choice to bring us “melancholy merriment” (OK, I’ll stop!). Let’s face it: this is ridiculous. No matter how many VSPs tell you differently, go with your gut. Negative interest rates are (yet another) form of confiscation. Faced with this, most thinking people (not an oxymoron!) will choose their mattresses over their bank accounts. Rather than watch their hard-earned savings slowly siphoned off in fees and tribute to the banking system, a deep hole in the backyard is preferable. Of course, there is gold. If you accuse me of taking this too far, consider that as proof of the confiscatory nature of negative interest rate policy (NIRP), it must be paired with a ban on cash. The twin rallying cries that negative interest rates will save us is always paired with the rejoinder that cash is obsolete. Cash holdings lead to ‘hoarding’. Cash is a barbarous relic of a bygone era. Of course it is. It is also a civil liberty. To have and to hold the money that I have earned (and paid tax on) must be at the core of property rights. To prevent me from accessing my very own property in order to exact tribute to private companies must not be legal. But I’m no lawyer, I'm just a gold owner. Maybe, at last, we have reached a critical juncture. Maybe, at long last, we can recognize the twilight of this illusion. Central banks cannot create prosperity. Jawboning the markets higher does not change the value of an investment. And there are no “heroes” who can save us. We must save ourselves. Look into that distant mirror and see that it is us. We, who have hoped for a savior, have the ability to save ourselves. See yourselves in that distant mirror. Save yourselves from usurpation, from further confiscation. Stand up. Don’t let it happen here. Oh, and buy gold. You’ll be joining me and a growing part of the world in buying more.